Learn all you need to know about the Private Rented Sector Minimum Energy Efficiency Standards (MEES) introduced in England and Wales in 2018, with Elmhurst's range of MEES Training courses. Our MEES training courses provide all the necessary information relating to this new legislation, including how it applies to those individuals in the Private Rented Sector (PRS) and how to achieve compliance. We deliver courses which cater to a range of audiences, including Landlords, Property Agents, Energy Assessors and other property professionals. Our expert trainers have a wealth of industry knowledge and will be able to advise you on how to best proceed, as we appreciate that each property can pose unique challenges. Suitable for: Private rented property owners/agents and landlords of residential buildings. This short express course is designed specifically for landlords within the domestic PRS; providing a basic understanding of MEES legislation and the potential challenges it poses to owners of private rented property. Suitable for: Private rented property owners/agents and landlords of commercial buildings. Gain a basic understanding of how MEES can impact property agents and landlords in the non-domestic PRS, with this short express course for commercial landlords. This specialist training session is designed to help DEAs get to grips with MEES legislation. From this you will gain comprehensive knowledge of MEES and can show extensive understanding of it to property agents and landlords in the domestic PRS. This course is designed to help NDEAs get to grips with MEES legislation impacting the commercial sector. With Elmhurst's specialist training you will gain comprehensive knowledge of Non-Domestic MEES and can use this when working with property agents/owners and landlords. Minimum Energy Efficiency Standards (also referred to as MEES) is government legislation introduced in April 2018, aimed at combatting fuel poverty and reducing CO2 emissions. The new guildelines state that domestic and commercial properties in England and Wales must achieve an energy efficiency score of at least an 'E' before the granting of a new lease or when a lease is renewed. MEES legislation is being phased in over the next five years and will eventuallty expand to include all existing privately rented property. How do I know if my property is compliant? It is already a requirement that a property has a valid EPC (Energy Performance Certificate) before it is let. 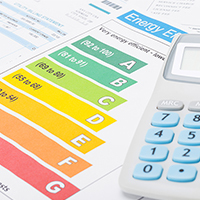 Organising an EPC can be done by contacting a qualified Energy Assessor, who will carry out a non-invasive assessment of the property, the calculations undertaken can produce an EPC, with an energy rating, typically shown on a scale from A - G ( 'A' being the most efficient and 'G' being the least). To arrange an EPC you can search for an Elmhurst accredited energy assessor here. Where it can be proved that efficiency improvements will not be cost effective. If improvements will decrease the value of the property by more than 5% (must be independently verified). Consent to carry out improvement works can not be obtained from tenants or the Local Authorty. When a lease is less than 6 months or more than 99 years. Exemptions last for five years and will need to be need to be independently verfied, before being lodged on a centralised register. Non-Domestic Property non-compliance fine: £5,000 - £150,000, this is linked to the rateable value of the property.